Is it tier or tyer? Whatever. 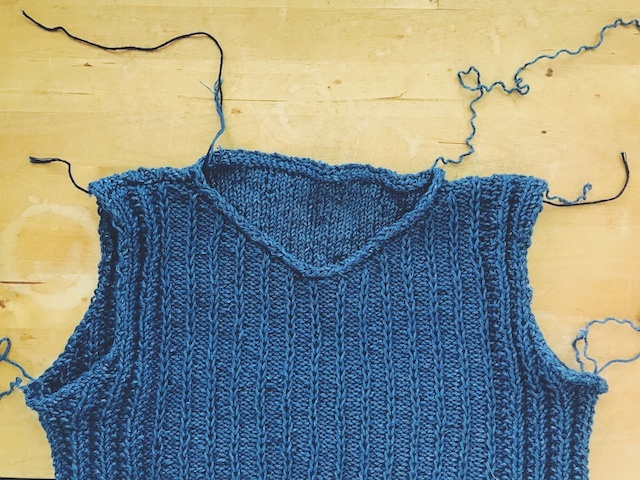 I wanted to post my progress on my Waterrock vest and Kinton tee, both by Jennifer Kelley of Appalachian Knits, but you'll have to prepare yourself because you're about to see the seedy underbelly of the knitting world: tiny, desperate, cotton ends, created by running short on yarn before the project is finished. And lots of knots. I did use the Magic Knot technique, as I did on the Baby Granny Stripe Blanket, but only halfway through the vest. So, there are still lots of ends- all of them short. But who cares? It fits! And I had enough yarn, just enough, to finish it! I blocked for width. I'd originally planned to knit it extra long so I could throw it in the dryer and still have a good length when the denim shrank, but I was too short on yarn for that. I also thought I'd mention that the I-cord edgings tighten things up a bit, so if it fits nice and loose before that, it may be fitted afterward, as with mine. In the same way, if it feels too loose at the neck and arms, you may just need to wait for the edgings to get the perfect fit. So, I won't be wearing this over button-up shirts, just tanks. I'm okay with that, especially since the Kinton tee, which I cast on immediately upon finishing my Waterrock, will have positive ease. Ignore any dirty paw prints you see on my patio furniture backdrop. Dogs run my life. Linton is loose, but not without a big 7" swatch. 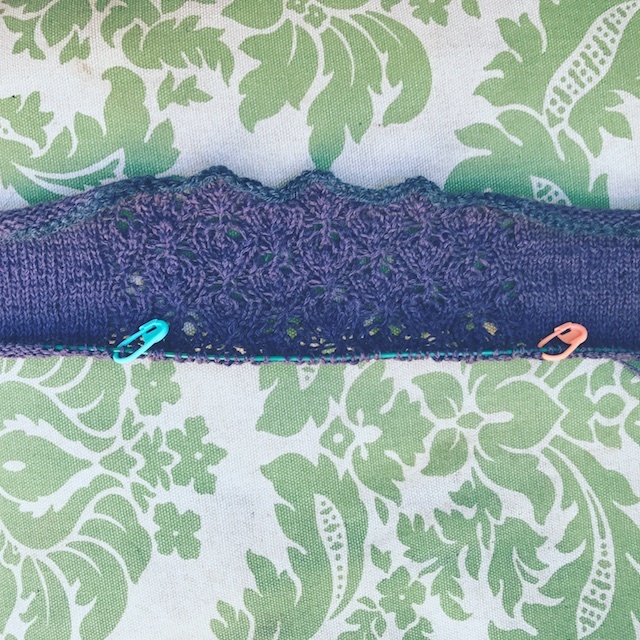 My real swatch was the perfect gauge when knit in Lindy Chain with size 0s. 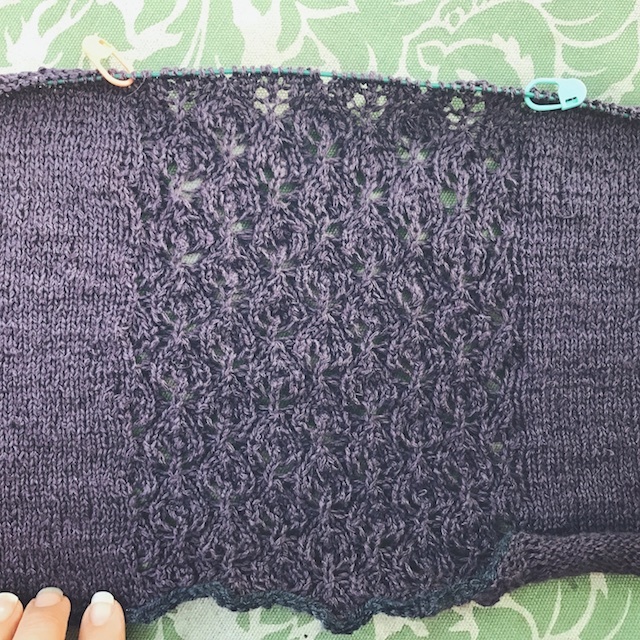 (Ah, my old friend 0's, how I hate you), but as I knitted the back panel, it got tighter and tighter. 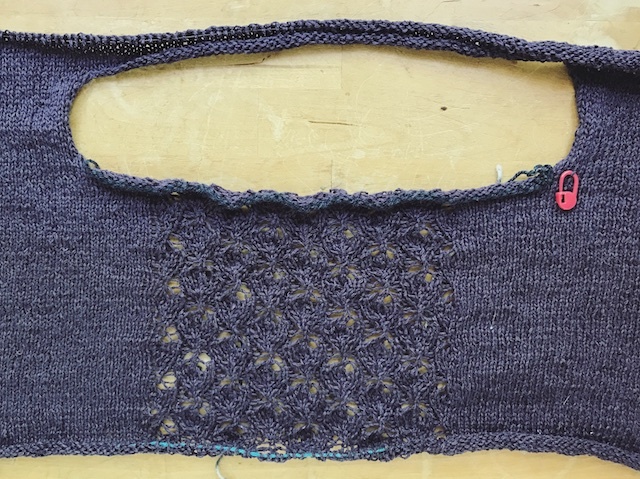 So the beautiful progress you see below was ripped back and re-knit into the progress you see beneath it. The second time I used size 2 needles like a normal person. It's actually moving fairly quickly now. As you can see I finished the neckline and began the front. When I join for working in the round, I think it will fly. 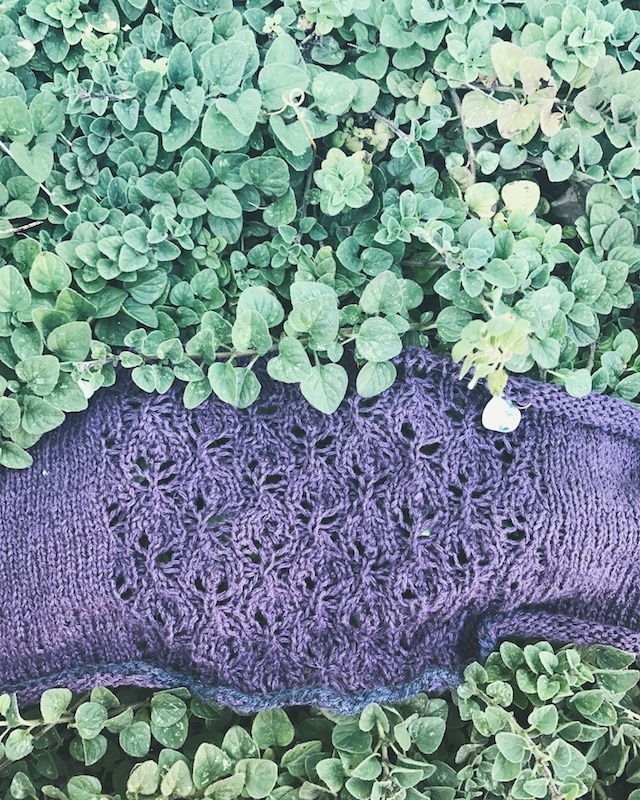 I didn't finish my Kinton in time for the end of the Appalachian Knits Spring Kal, so I obviously never gotto the Allegany shawl or Old Rag, but I will get to them. Both Waterrock and Kinton should be included in the second quarter of the Natural Wardrobe MAL, either and maybe the Tops Tanks and Tees KAL, if there's an extension. I have been rotten about reading your blogs and posting here. This is a busier time than I predicted- my daughter is graduating from college, my son's end of the year banquets, prom, award ceremonies, Eagle Scout project, and doctor appointments with my grandmother. Somewhere in there I brush my hair, occasionally. But, but I am determined to post a little something more regularly just to keep the habit alive and a time carved out of my evenings cause I miss you guys.